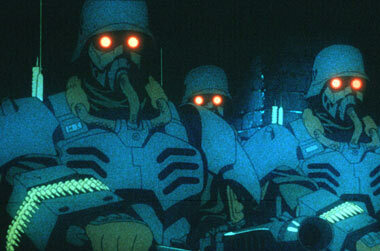 Written by Mamoru Oshii (the director of the cult favorite Ghost in the Shell) and directed by Hiroyuki Okiura (a key animator on Akira), Jin-Roh: The Wolf Brigade offers a violent but compelling vision in animation. The story is set in a fictionalized version of the recent past, when a repressive Japanese government is battling the Sect, a violent revolutionary organization that uses adolescent girls they call "Red Riding Hoods" as couriers. During a raid, Capitol Police Constable Kazuki Fuse (pronounced "foo-seh," voice by Michael Dobson) balks at killing Nanami Agawa (Maggie Blue O'Hare), one of the Red Riding Hoods. She commits suicide with a powerful bomb. While Fuse undergoes retraining, he meets Nanami's older sister, Kei (Moneca Stori), and initiates an odd romance. Soon both characters are caught in a web of plots and counterplots that center on the possibility that Fuse may be a "wolf," a member of a secret cabal within the Capitol Police. 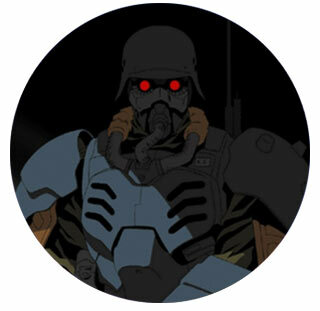 Jin-Roh is drawn in a comic book style that recalls the work of the popular graphic novelist and film designer Jean "Moebius" Giraud; Okiura's skillful cutting and striking imagery transcend the limited animation. Although anime continues to grow in popularity in America, it's rare for a Japanese feature to receive even a limited theatrical release, as this one did: a dark, brooding film of exceptional power, Jin-Roh deserves to be seen by a large audience.